The trip to Gravesend did not start well with the coach arriving an hour late to pick up the teams, although it is unlikely the players were too worried by a curtailed warm-up in view of the heavy rain that greeted them on arrival. There were six changes to the Thanet squad from that which played against Horsham last week. Jay Sanford is progressing well after his leg fracture, his place was taken by Danny Clement returning after long term injury whilst Kieran Wright replaced Kris Finneran who broke a finger last week. Jay Morbey was back in the squad following injury at work to acting captain Adam Gaddes. The back line was reshuffled in the absence of the injured Sam Rolfe with Stewart Box at full back and a new centre partnership of Stuart Plumridge and Dan Hill. Wanderers kicked off and started well despite the testing conditions. A pair of penalties took them close to the Gravesend line but no points transpired and a penalty for the home side after ten minutes allowed them to mount their first real attack. Well practised work from the pack saw them rumble over and the conversion made it 7-0. On twenty minutes a 25 drop out sailed straight out and Wanderers found themselves under pressure from the scrum back and lock Arek Janeczko was the one shown a yellow card. A second try came under the posts for the home pack minutes later for a 14-0 lead. A penalty to Thanet did not make touch and a second shortly after set a good position but the line-out was lost. The poor conditions were posing problems and a dropped catch was hacked on by Gravesend. Reece Hougham’s tackle saved the initial danger but the home pack then registered another try that was unconverted. Kieran Wright on his first start of the season now had to withdraw with the recurrence of a shoulder injury. Tom Walton raised Wanderers’ hopes with the final play of the first half. A lovely break saw the young scrum half slice through the home defence for a fine individual try. No conversion but at half time Wanderers had a toehold at 19-5. Gravesend kicked off the second period and quickly mounted a rolling maul. It appeared Thanet had managed to halt the maul on several occasions as it trundled towards the line but the referee disagreed and the home side went 24-5 ahead. Stewart Box was withdrawn to be replaced by Jackson Perry. Kamil Wiecaszek secured a penalty at a breakdown. Wanderers were attacking well’ A strong forward drive went close and from a five metre scrum and a quick heel Walton spotted space before handing. on to Hougham who finished a good move well. The try was not converted and the score was 24-10. 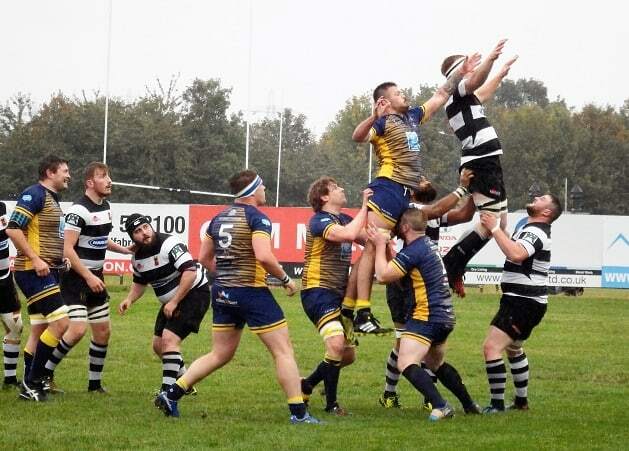 Thanet stole a line out and Wanderers momentum continued with Walton’s good hack. Twenty minutes remained when Clement made his first appearance of the season replacing Jake Webster. Stuart Plumridge was punching big holes in the midfield and Marius Thompson maintained pressure with a speedy chase. A crucial knock on handed the initiative back to Gravesend who cleared to thirty metres. Today’s captain Andy Letts and Plumridge broke well and continued pressure from Wanderers led by Neil Wakefield resulted in a yellow card for Gravesend. Perry used his pace to force a knock on but a further try was elusive. As time ran out careless backchat saw Thanet marched back twenty metres and Morbey was forced off with a recurrence of his shoulder injury. The whistle soon ended the match as the rain continued to pour down with the score remaining at 24-10. Wanderers never fully came to terms with the cold and wet conditions with numerous errors breaking down their momentum. Gravesend, faced with the same situation, took a pragmatic approach that wasn’t pretty but was effective and brought them five league points. 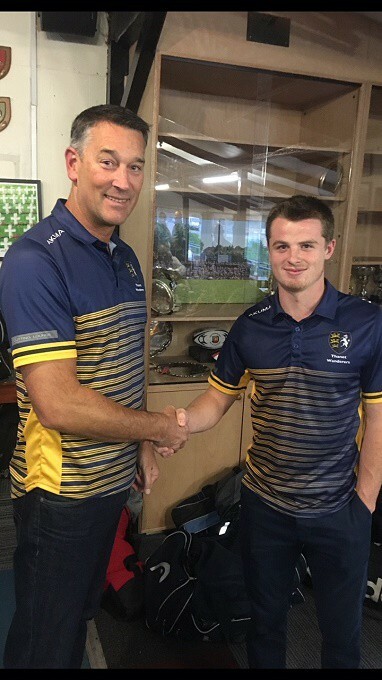 In the pack Chris Hood again showed well as did David Lemon in the back row but the coaches’ choice as man of the match was Tom Walton (pictured below with Mike Pond) who was lively and inventive, scored a first class try and was a constant threat to the opponents.